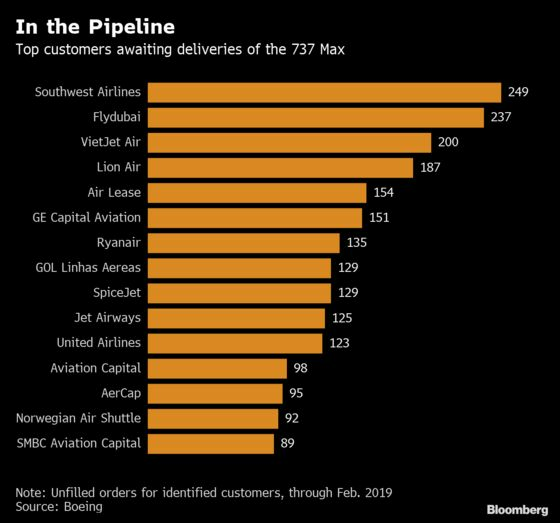 (Bloomberg) -- Boeing Co. will soon learn whether the financial fallout from the global grounding of its best-selling jetliner will be a brief jolt -- or a much more painful ordeal that would have repercussions for suppliers and the U.S. economy. “We continue to build 737 Max airplanes, while assessing how the situation, including potential capacity constraints, will impact our production system,” Paul Bergman, a Boeing spokesman, said by email. Boeing hit a setback on Thursday, when Ethiopian authorities defended the pilots of Ethiopian Airlines Flight 302, saying the 737 Max 8 plane crashed on March 10 despite the cockpit crew having followed Boeing’s safety procedures. During the press briefing in Addis Ababa, Transport Minister Dagmawit Moges also called on Boeing to review its aircraft control system. Still, the officials stopped short of saying the plane has a structural problem. Boeing has several options as it maps production scenarios for the 737. It could postpone the rate increase and perhaps freeze share repurchases to preserve working capital. 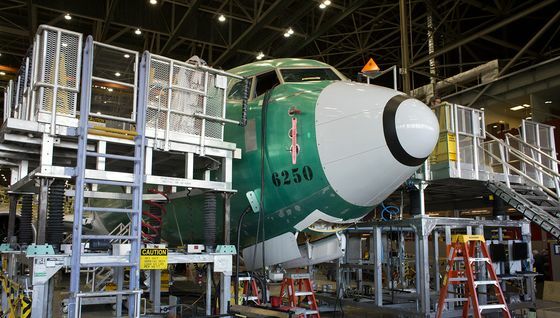 If the grounding extends late into the year, the company could slow work at its 737 factory in Renton, Washington, as it did twice following the Sept. 11 terrorist attacks. The worst case would involve temporarily halting production of the largest U.S. export. That would ricochet through the economy from Seattle to Wichita, Kansas, where Spirit AeroSystems Holdings Inc. manufactures 737 fuselages. The resulting layoffs and lost sales, rippling down to machining shops and other small businesses, would shave 0.15 percentage point off U.S. gross domestic product this year, according to JPMorgan Chase & Co. Spirit AeroSystems dropped the most in eight months after Cowen & Co. downgraded the stock, citing the growing risk of disruption to a plane that accounts for nearly half of the supplier’s revenue. Boeing fell 1.5 percent to $384.74 at the close in New York. Based on past practices, Boeing isn’t likely to give its suppliers “much advance warning of a rate adjustment,” Cowen’s Cai von Rumohr said. A Spirit spokeswoman declined to comment. A swift return to normal looks increasingly unlikely for the Max. Boeing engineers are still finishing work on a software update for a stall-prevention system linked to a Lion Air crash into the Java Sea off the coast of Indonesia in October, and the fatal dive of an Ethiopian Airlines plane near Addis Ababa last month. The disasters killed a combined 346 people. Boeing said April 1 that it would be several weeks before the software patch is submitted to regulators. The U.S. Federal Aviation Administration vowed a rigorous review, while authorities in Europe, Canada and China plan to do their own analysis. If U.S. regulators agree that the software upgrade resolves safety concerns, they might lift the grounding while foreign reviews are still underway -- relieving some of the pressure on the planemaker and its suppliers. The mini-rally in Boeing shares in the last week suggests that investors view that as the likeliest outcome, with parallels to the speedy turnaround after a three-month grounding of the 787 Dreamliner in 2013. But it would be difficult for Boeing to increase 737 output until the grounding is lifted and safety concerns ease, von Rumohr said. For each month the Max is idled, Boeing faces estimated losses of $1.5 billion to $2.7 billion, said JPMorgan Chase analyst Seth Seifman. With deliveries suspended, airlines may halt advance payments that cover Boeing’s manufacturing costs, he said. Airlines typically pay about 40 percent of the purchase price while a jet is being built, and the remaining 60 percent when they sign for the completed aircraft. Boeing would be able to absorb a three-month delay that consumed about $6 billion of cash, Seifman said, and the company would recoup the money once deliveries resumed. But the longer the grounding drags on, “the more management will have to consider how much cash they want to forgo in the near term,” he said. There’s a silver lining if Boeing postpones the accelerated production pace. That would grant a reprieve to suppliers still struggling to meet the 52-jet monthly schedule Boeing adopted last year, Seifman said. One example is CFM International, which makes the plane’s Leap engine. CFM, joint venture between General Electric Co. and Safran SA, has been working to get back on track and has no plans to alter production schedules, spokeswoman Jamie Jewell said. 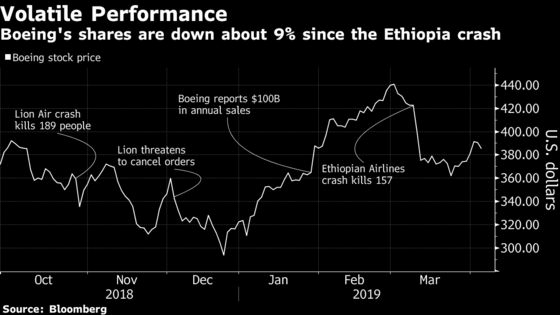 While Boeing’s market value sank more than $30 billion in the aftermath of the Ethiopian crash, the selloff appears greater than any estimate of the actual cost to the planemaker, or the market share likely to shift to Airbus SE, said Carter Copeland, an analyst at Melius Research. While Lion Air has threatened to cancel orders, other prominent buyers such as Southwest Airlines Co. have expressed support. And it’s early days for a program that Copeland estimates will generate $86 billion in profit for the Boeing through 2030.